There are many ways that you can categorise wooden flooring. You can group these floors in terms of the material type, the material form and the way the floor is laid out. The type of flooring that is appropriate in any premisis will be based on the amount of traffic and the level of punishment that the floor is expected to receive over its lifetime. We have found through experience that Pine (softwood) and Oak (hardwood) are the most popular floors that have been laid in the UK over the years. However, there are also exotic types of timber that are available nowadays such as Bamboo and Teak which are also used as flooring material and chosen mainly for their appearance and durability. A wood floor can also be classified based on the form of the flooring material used. The types include solid wood, acrylic-impregnated and engineered. The solid wood is basically defined as such - a solid piece of timber. On the other hand, the engineered flooring is made of layers of thin pieces of hardwood. The criss-cross layering of this type of material makes it a perfect option in floor conditions requiring support for more force and weight. Finally, Laminate - a multi-layered synthetic product which produces a floor material that is able to withstand normal household traffic. Another way to categorise wood put down as flooring is by its size and the pattern used to lay it out onto the floor surface. Wood floors are sometimes laid in strips which are basically long pieces of wood with a range of different widths. The most popular floors laid in older buildings over the years were planks made from Pine wood. Finally our favourite - parquet wood flooring (see below). These are intricate little pieces of wood laid in alternating directions and assembled in attractive geometric patterns. The installation method can also be the basis in classifying the type of wood flooring. There are wood flooring types that are attached to the sub-flooring beneath it, and this type is fixed using staples, glue or nails. There is also another type of wood floor under this category known as the floating wood floor which is not fixed to the floor beneath it. Instead, a layer of foam underlay is laid on top of the sub-floor and the wood pieces are fitted together on top of this foam material. These are manufactured by using several layers fixed together. Each floorboard consists of 3 or 4 layers of wood which have been glued together at right angles to create a plank measuring approximately 14mm thick. The real wood veneer on top is only 4mm thick but it can still be carefully sanded and treated to restore the original finish after being scuffed, worn or damaged. It cannot be laid anywhere where it will be exposed to water of in a humid atmosphere and it is not easy to achieve a really good finish in difficult areas such as around toilet pans and pedestals. However, it is more stable than solid wood, and less prone to alterations in temperature and humidity. This type of floor covering was developed in 1997 by a Swedish company called Perstorp using the brand name Pergo. Its popularity has increased mainly because of its affordability compared to a real wooden floor plus the fact that DIY enthusiasts can easily carry out an installation with basic skills. This multi-layered synthetic product is really just a printed strip of vinyl on a fibre board. Different layers are fused together with a system using heat, glue and pressure known as lamination. A clear protective top layer is put over a photographic applique layer to simulate finished wood-grain. These two boards are then put on fibreboard with melamine resin. The tongued and grooved planks are usually clicked together and laid on top of a foam underlay to create a floating floor. They can have an unnatural appearance and problems associated with laminated floors include the following; they are almost impossible to repair, make a hollow sound when walked on and the surface is easily scratched. The HDF (high density fibreboard) is also very susceptible to water damage which can result in buckling. This is the most common type of wood flooring we are asked to restore. The solid wood planks are usually thicker than engineered wood, and have a hardness score which indicates how easily they can be damaged. Each plank is fitted using a tried and tested tongue-and-grooved method. The number of times this type of flooring can be sanded to restore the finish is dependent on how deep the tongue is set from the top of the board. The problems associated with this type of flooring are that is swells in damp conditions and shrinks in dry ones, but there's no doubting that it looks really great after sanding providing it has been installed correctly in the first place. The two most common designs used in the UK are the herringbone pattern, which is named after the herring fish - known for being quite bony. 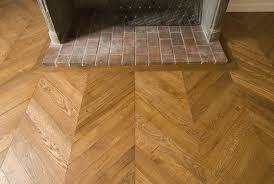 This style has each wood block finishing perpendicular to the next resulting in a broken zigzag. It is perhaps the most popular pattern in the UK, and is usually made from a single species of wood, but sometimes comes in strongly contrasting timber colours. Herringbone battens are square ended as opposed to Chevron tiles shown in the smaller picture, which are cut at an angle between 30 and 45 degrees. The wood blocks run point to point and the ends are cut at an angle to create a continuous zigzag design as opposed to the herringbone style which has each wood block finishing perpendicular to the next resulting in a broken zigzag. Some people prefer to have a less complicated pattern such as Basketweave Parquet because it's simple design blends-in and presents a better backdrop for rugs, ornaments and furniture etc. However, this pattern is created with smaller tiles which can be easily lost if they become loose.